Yuzu production and consumption in Japan is the higher than any other country in the world. 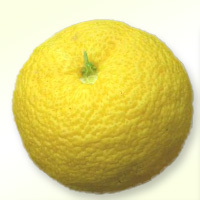 Yuzu gets its aroma from a substance known as yuzunone. In order to bring out Yuzunone, Yuzu must be squeezed. Yuzunone is contained in yuzu peels. In order to bring out yuzunone, the lower half of yuzu must be faced up when squeezing. This helps bring out the aroma of yuzu even further. The calories in Yuzu per 30g(2tbsp par item) is 6 calories. Yuzu is calculated to be 21Cal per 100 grams making 80Cal equivalent to 380.95g with 2.1g of mostly carbohydrates、0.15g of protein、0.03g of fat in 30g while being rich in vitamins and minerals such as Vitamin C and Potassium.